The GBPUSD was able to move (well sideways move) above the topside trend line on the hourly chart today, but the highs from last week have given buyers some cause for pause. The London session lows have so far found buyers near the level. That trend line comes in at 1.3060. 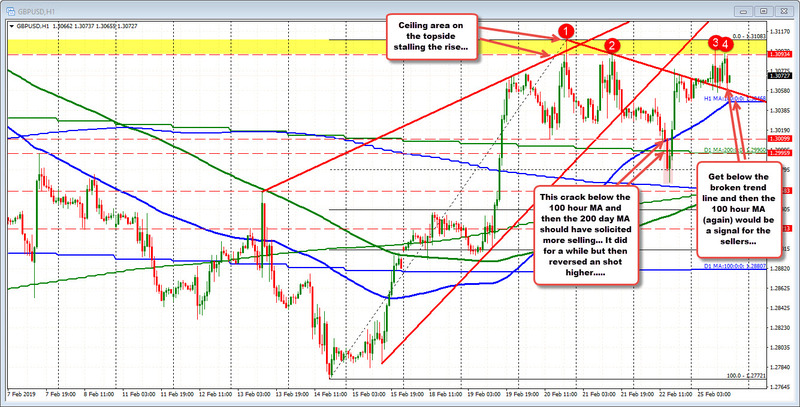 The rising 100 hour MA comes in at 1.30468. Moving below each would shift the bias to the downside. On Friday, the price cracked below that MA line - along with the 200 day MA (today at 1.2996) - but when the price approached other MAs (see the lows from Friday) - the price reversed. Getting back above the 200 day MA and the 100 hour MA was the signal for the shorts to "Get Out", and the price moved back higher. Buyers and sellers are battling it out. So, the battle lines are drawn wth the 100 hour MA below and the highs from last week/today on the topside (yellow area). Between those goal posts....well you can see the price action today. A little up... A little down.